The name of this group translates to "The Honored City's Brigades." Its origins lie in the days of the Sunni insurgency of the Iraq War, though it is quite clear that it was an independent group. 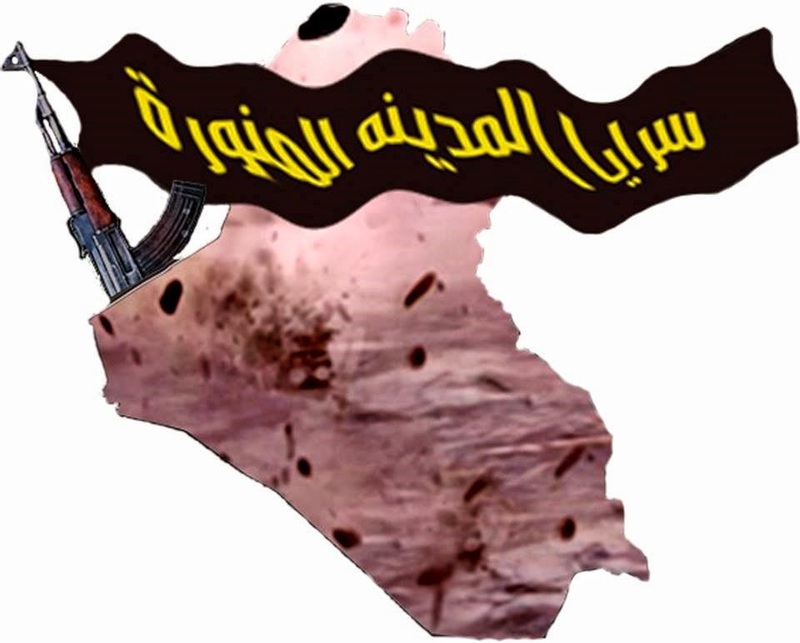 For example, in this posting from September 2007, it is identified as one of the "jihadi groups not rallying under any front," contrasting with, most notably, the "Islamic State of Iraq" umbrella that included al-Qa'ida in Bilad al-Rafidayn. Like the Jaysh al-Mujahideen, Saraya al-Madina al-Munawara has begun advertising its military activities more openly on social media with the revival of the broader Sunni insurgency since the beginning of this year. According to a media representative for Saraya al-Madina al-Munawara whom I interviewed, the group "was established after the beginning of the occupation, and continued fighting until the occupier left. After the occupier left, it undertook secret work, and when the battle in Syria began, some of the youth went to Syria to fight there, and a contingent within Iraq remained to prepare for the occasion to go to Syria, and after that the battle began in Iraq." To be sure, the media representative's claims of secrecy post-American withdrawal in 2011 explain the lack of media material demonstrating a supposed presence within Syria. A contingent fighting in Syria hardly comes as a surprise if true. Tying the Iraq and Syria struggles together is not solely the preserve of the Islamic State of Iraq and ash-Sham (ISIS), but also articulated by ISIS' rivals in Jamaat Ansar al-Islam (which has ideological affinity with ISIS and has openly deployed a contingent to Syria), the Islamic Army of Iraq, and Jaysh al-Mujahideen. However, unlike these aforementioned groups, Saraya al-Madina al-Munawara does not see itself at odds with ISIS, as indicated to me in the interview in response to a question I posed on relations with ISIS: "Our program is the book [i.e. the Qur'an] and the Sunnah. We have no disagreement with any of the mujahideen. Our aim is the establishment of justice and a rightly-guiding Caliphate." At the same time the representative expressed hopes to me for unity among the insurgent groups, saying that if such unity were achieved, they could reach Baghdad "within days." The testimony thus related points to a clear Islamist outlook, though the open-source discourse does not place emphasis on establishing the Caliphate in the manner stressed by ISIS and Jamaat Ansar al-Islam. There is no reason here not to accept the claims of good relations with ISIS. Though I have documented tensions with groups like Jamaat Ansar al-Islam and Jaysh al-Mujahideen (who, incidentally, have taken advantage of the chaos ensuing the fall of Mosul to launch a new coordinated offensive in the Hawija area of Kirkuk), it is apparent that others are willing to work with ISIS and even hail their efforts. "Jaysh al-Mujahideen unite with their al-Ansar [i.e. Jamaat Ansar al-Islam] brothers," as part of Operation "Kirkuk is being liberated." An instructive case-in-point is the local Mosul franchise for the General Military Council (GMC), which is a front group for the Ba'athist Naqshbandi Army (JRTN). With the Mosul branch having previously hailed ISIS as "lions of the desert," the GMC recently released a statement on the fall of Mosul in which it claimed that "the rebels of Mosul in all their factions- by God's preference- seized complete control of the right side of Mosul [i.e. 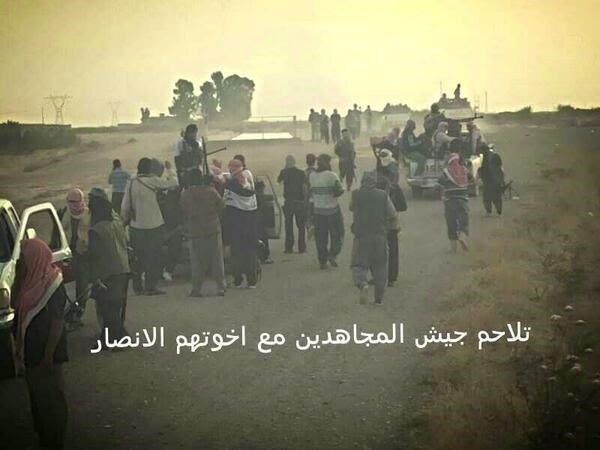 the side west of the Tigris River]…and all the political and security leadership fled." 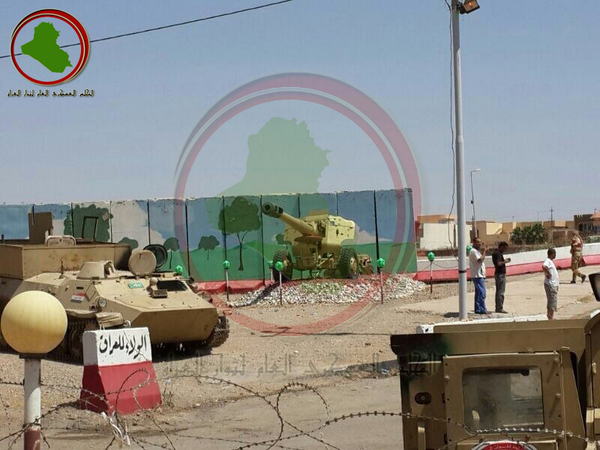 The GMC also released some photos showing capture and destruction of Iraqi army equipment in the wider Ninawa province. 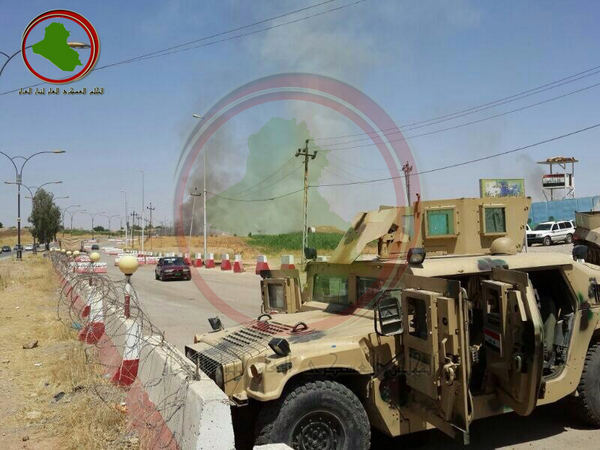 Though there is good reason to be skeptical of the GMC's claims to have participated in the takeover of Mosul in light of past stealing credit from ISIS for new insurgent offensives launched in Anbar province (most notably in al-Zuba' and al-Karma, with the record subsequently clarified in ISIS' favor here), two conclusions are to be drawn here: first, neither JRTN nor its front groups wish to confront ISIS, regardless of true feelings towards ISIS, and second, other groups are clearly exploiting the vacuum created by the ISIS-dominated takeovers of new areas in Ninawa, Kirkuk and Salah ad-Din provinces. There is a possibility that the eventual arrangement in Mosul may parallel Fallujah, where there is sharing of the city between ISIS and other insurgent groups but as per a virtual agreement on ISIS' terms, or parallel to the nebulous co-existence between the Assad regime forces and the PYD in Qamishli. Coming back to Saraya al-Madina al-Munawara, it remains to discuss the group's area of operations. According to the media representative I interviewed, the group does not openly proclaim or advertise many of their operations, but from what can be gathered from published material, it would appear the group primarily operates in Anbar (to be more specific, the wider Fallujah and Ramadi areas), and like other minor insurgent groups its attacks are mostly limited to mortar strikes and hit-and-run style operations. This does not exclude the possibility of their operating in the wider area. Though dwarfed by the size and capabilities of ISIS, the case of Saraya al-Madina al-Munawara does illustrate the complexity of intra-insurgent dynamics going beyond the well-known rivalries such as the tensions between Jamaat Ansar al-Islam and ISIS, further eroding any government hopes of making gains against ISIS and the wider insurgency.